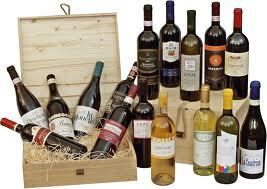 The Italian wines and specially the doc and docg center Italian wines are gastronomic products of very high quality. A bottle wine of Sagrantino of Montefalco, of Orvieto Classico, of Sangiovese, of Grechetto of Todi or of one of the other Umbrian Italian wines deserves a careful and deep tasting. The doc and docg Italian wines are guaranteed from state organizations for what is concerning the areas of origin, the use of the appropriated grapes for each wine, the quality of production and the techniques of bottling. A bottle of wine, therefore, is only the accomplishment of a long process that implicates the entire chain of production of the Italian wines and that sees in the mark reserved to the doc and docg wines the official recognition of the wine and gastronomic excellence. Also the classical bottle of wine "bordolese" has been selected throughout the times in order to find colors and forms that could maintain along the time the taste of the Italian doc and docg wines and preserve them from the attack of the sun rays; Therefore, the bottle of wine should not be considered just an accessory of the gastronomy but an important accomplishment to distinguish the doc and docg wines among all the Italian wines. To taste a bottle of Italian wine and in a special way an Umbrian one is a gastronomic experience that puts in contact with an entire world of traditions and wine art. In Umbria are produced wines among the most prestigious of Italy; a list of them is obviously partial but among them one can not forget the Sagrantino of Montefalco, the red of Torgiano, the red of Montefalco, the Orvieto Classico, the Grechetto of Todi and the white and red wines from the Amerini hills. We should also remember that thanks to the particular morphologic structure of the region it is possible to cultivate diverse grapes also in nearby areas; this allows to combine the various grapes in order to make the final product wealthier of taste and flavor shades. It is rare to discover other areas of wine production where you can simultaneously count so many cellars with such a large range of products like in Umbria. Therefore it is absolutely the case, for who has the chance to visit this region, to taste the food and the drinks of Umbria. For those who, on the contrary, can not in this moment take a vacation in Umbria, they will find a valid and equipped shop online on our site, so that even if they can not lose themselves in the Umbrian panoramas they will al least be taken by the flavors and the perfumes of this land.